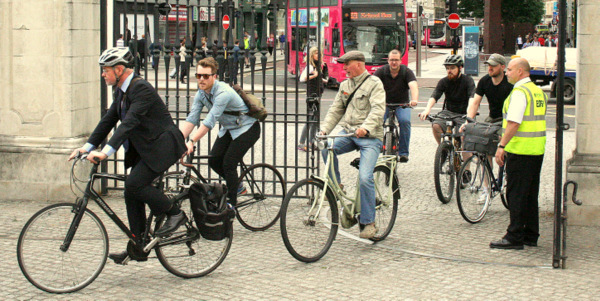 The Draft Bicycle Strategy for Northern Ireland needs your input. A public consultation is running until Friday 21st November 2014, and your views will help to determine the path which DRD will plot over the next 25 years to deliver the Cycling Revolution™ in Northern Ireland. 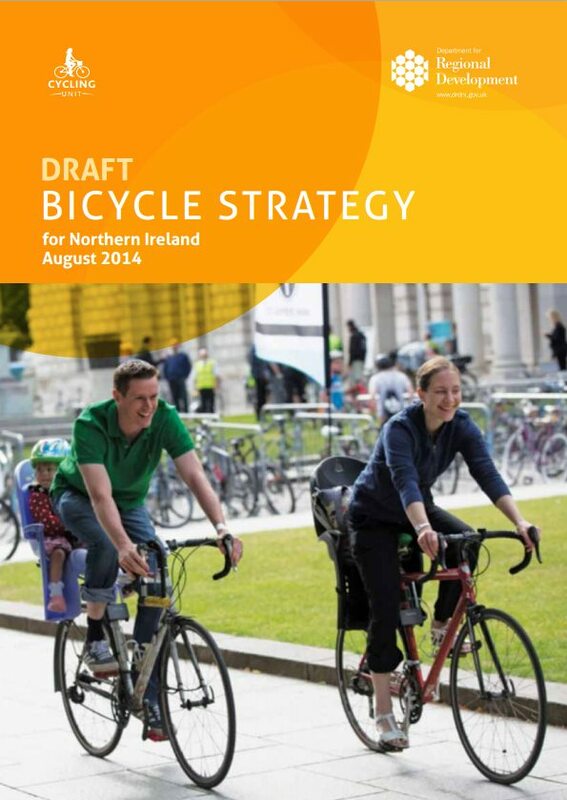 You can read the full Draft Bicycle Strategy for Northern Ireland by downloading it from the DRD website. You can respond to the Draft Strategy a number of ways, listed at the end of this article. So, what are the hot topics for @nigreenways in the Draft Strategy? Confusing pre-Bicycle Strategy outbreak of everyday cycling; ignore this..
A decent start, but it’s a few tweaks away from perfection..
Don’t repeat the past mistake of positioning the Bicycle Strategy as a government-led attempt to cold start growth in cycling. Credit is due to DRD for your work over the last year to create the Cycling Unit and this Strategy, but you are pedalling furiously to catch up with the reality on the ground. Cycling is on a clear growth curve, even if it remains quite niche as a province-wide activity. An inspired and serious government intervention is needed to push cycling into the mass market. Take this obvious opportunity to put the Bicycle Strategy on the front foot and present a far more efficient vision statement.. Sorry, but the twelve words after “bicycle” in your vision is meaningless filler. It sounds like a really bad DOE road safety advert (and there are many of those) and I genuinely believe the DRD Cycling Unit is better than that. Drop it. Inspire us. Bicycle Strategy or Cycling Strategy? It’s astounding how much precious time and oxygen was wasted at stakeholder consultation events discussing this. Knock yourself out. Moving on..
As for those fast commuters, alarm bells should be ringing at DRD when everyday bicycle commuters with decades of experience can’t take the hassle on Belfast’s busiest roads any more..
What are the logical outcomes of designing for types of cyclists when DRD considers future route development plans? That high-quality separated cycling infrastructure is less likely around workplaces, or on arterial routes? That it’s more likely around schools? How do you measure the demand among different groups in any particular area? Good luck showing me an area in Belfast that is purely dominated by one of these types, especially if the Cycling Revolution™ actually happens. This section got a roasting back in August.. I was planning to write a pithy tirade detailed explanation of why the inclusion of user profiles is a very bad idea, but I’ll give you a 100% guarantee that this section of the Draft Strategy is going to be quietly dropped for the final version. Why? Fast forward to November and everything changed..
And who is @bricycle? He’s Brian Deegan, Principal Technical Planner at Transport for London who’s worked in project management on the London Cycle Network for the past six years – and one of the speakers at the recent Changing Gear conference, organised by (wait for it) the DRD Cycling Unit.. The simple principle behind the world’s best cycling infrastructure (also highlighted by Brian Deegan at the conference as being in The Netherlands) is that cycling infrastructure should be designed for everyone to use. To plan a Bicycle Strategy on any other basis puts compromise at the heart of the next 25 years of development. This is crucial to success – access to the power and influence of the shocking number of government organisations with responsibility for cycling here will determine positive outcomes. Understanding of the needs of cycling development is patchy – eg the Public Health Agency definitely gets it, but the Department for Social Development (leading on public realm projects) does not.. Along with finding guaranteed annual funding for this grand vision, how well the DRD Cycling Unit and the Minister can marshal and direct cycling activities across government will determine the Bicycle Strategy’s success. Which leads us neatly on to..
After many discussions I understand (and to some extent sympathise with) DRD’s rationale for not placing an over-arching target within this strategy. The subsequent Delivery Plan, city and local area masterplans will carry the SMART objectives and targets. Grand, and the campaigning corps can’t wait to get its teeth into those plans. Having no big target(s) may lend flexibility to your work, or could be the biggest flaw in the foundations of the Bicycle Strategy. A big target certainly isn’t “useful in encouraging people to use the bicycle” but it is close to essential in navigating the political stream for 25 long years. Imagine a future Transport Minister defending DRD Cycling Unit infrastructure plans with this robust certainty. This particular issue was about a railway upgrade plan in difficulty, but because it’s in the Programme for Government (PfG) there’s no argument about “if”, just “how”. Cycling needs its own place among the PfG targets. 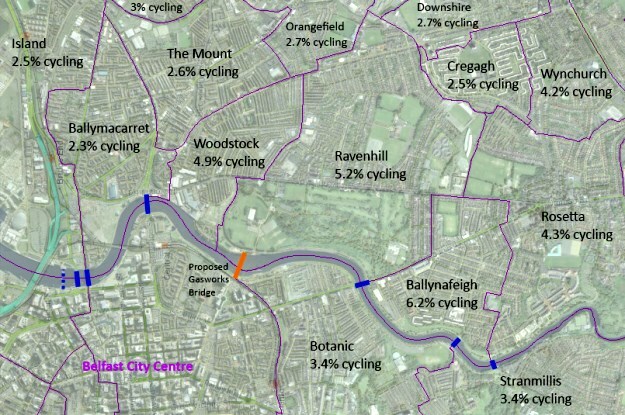 Splitting by urban/rural, or Belfast/rest of NI makes a lot of sense given the diverging cycling environments. But if cycling infrastructure planning and/or an over-arching growth target is in there after the next election, a mainstream budget will be easier to embed, and suddenly cycling climbs one more step above the day-to-day political fray. Will a series of area plans with targets and budgets make into the PfG? That’s highly doubtful. Does this risk leaving each plan to fight tooth and nail for survival in a hostile political environment? So make sure you’re being smart about that target decision, and think about the realpolitik in 2 years, 5 years, 10 years, 20 years from now. Can you make it politically super difficult for the next Minister to roll back on commitments made in the Bicycle Strategy? Can ambitious headline targets foster competition between political parties to build reputations, policy commitments and delivery on cycling? Or will you be kicking yourselves as the vision and aspirations slowly evaporate over the years? I welcome the Draft Strategy, but more importantly I have faith in the quality of the people who are working in the DRD Cycling Unit. This is a once-in-25 years opportunity to get it right.. 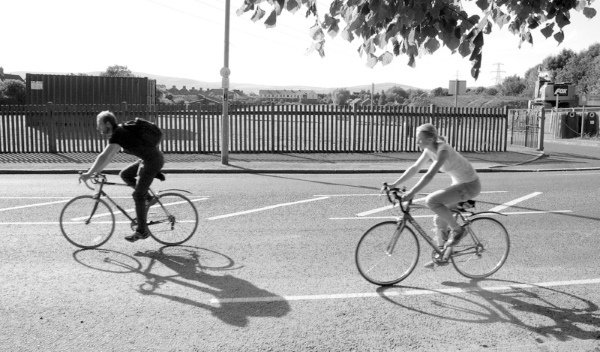 The strategy contains some excellent and progressive content, setting a strong commitment to embedding cycling firmly within the transport mix in Northern Ireland. There’s even recognition that “dedicated cycling tracks” are needed in urban areas which will take road space away from motor vehicles. 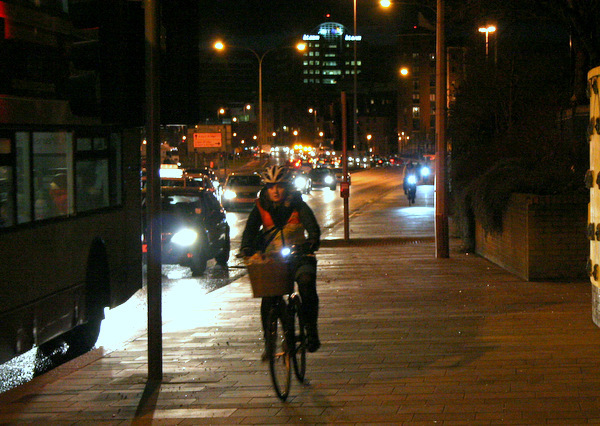 It talks the talks, and promises to walk the walk – just what a progressive cycling strategy needs to be in 2014. 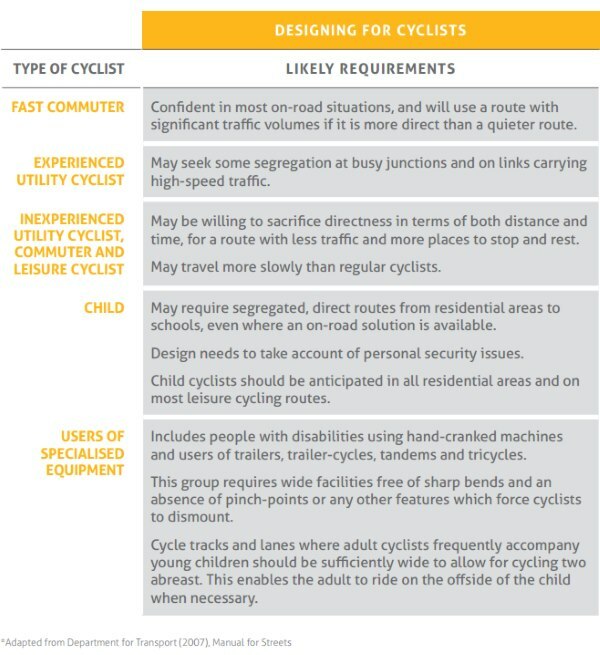 Except (if you haven’t it figured out by now) this isn’t from the new draft Bicycle Strategy for Northern Ireland 2014. 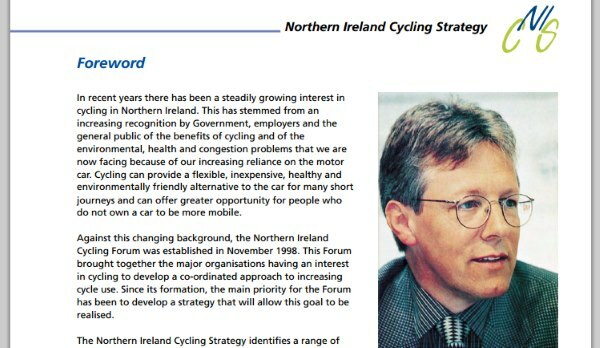 This is all lifted from the Northern Ireland Cycling Strategy 2000 (PDF, 8.56MB) published back when the politician at the DRD helm was the future First Minister of Northern Ireland, Peter Robinson (to this day a regular cyclist). Technically, it’s still the framework for cycling in Northern Ireland (that second target was to 2015). This isn’t a full autopsy on the 2000 strategy to determine its failures and successes; for the most part, that will be obvious with even a basic knowledge of current cycling conditions here. In reading DRD’s new strategy, it’s important to remember our history, so that we are not doomed to repeat the mistakes. I’m not even going to critique the new draft Bicycle Strategy for Northern Ireland line by line – smart heads in DRD have kept it light and punchy, easy to read – so go and draw your own conclusions (PDF, 699K). It’s in consultation until Friday 21st November, so if you have even a passing interest in seeing cycling conditions improve in Northern Ireland please send your views to cycling.unit@drdni.gov.uk. I’ll publish my submission when it’s sent. Cargobike Dad tackles the new strategy and matches my own positive thoughts on how its shaping up. 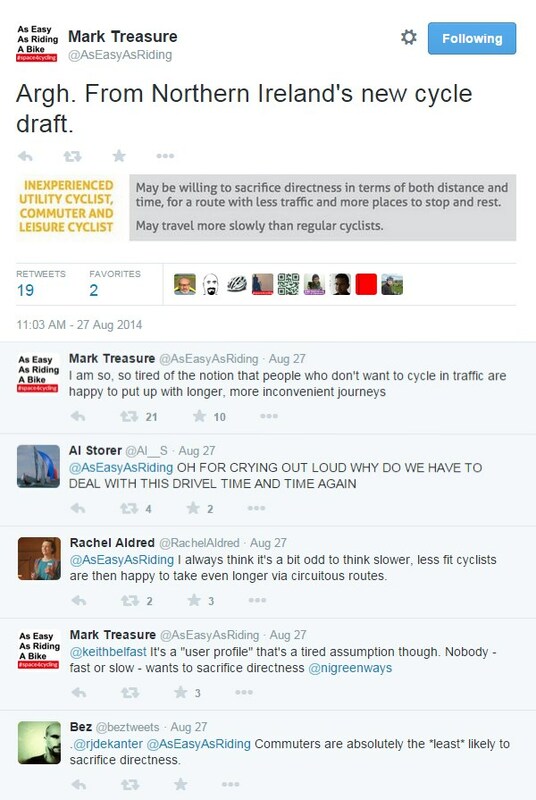 However, this includes the concerning use of cyclist ‘user profiles’ to influence future route design. 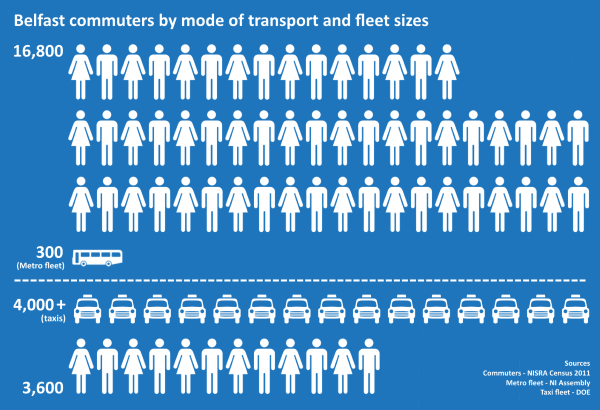 Dutch cycle network design principles and density means everyone can cycle everywhere. DRD want to be “visionary in our approach and we want to embrace innovation” so why this rush to compromise at the outset? Hopefully concerns will be taken on board. @roywhite_ni @nigreenways @niroads Cycling infra should be suitable for all ages, all abilities, not separated out by cyclists' competence.
.@niroads "we expect elderly motorists will favour the slow winding coast road to enjoy scenery rather than direct, yet fast&scary motorway"
@keithbelfast @AsEasyAsRiding @nigreenways change cyclists for motorist or any other method of transport and you can see how stupid idea is. In the encounters I’ve had with DRD staff who wrote the strategy (the new Cycling Policy Unit) I’ve found them to be genuine, passionate, open, honest, pragmatic but genuinely open to ideas, savvy operators in a tough Departmental environment and (should it matter) all normal everyday cyclists – the right people in the right place at (hopefully) the right time. They deserve a chance to make a difference. Despite the hyperbole of Danny Kennedy’s call for a “cycling revolution”, I am sold on the Minister’s commitment (and that of his advisors and staff) to what cycling investment can deliver for his department and for Northern Ireland. Austerity is beginning to rain down hard on budget rounds, and only half of DRD’s £2m capital bids for cycling in June were approved. 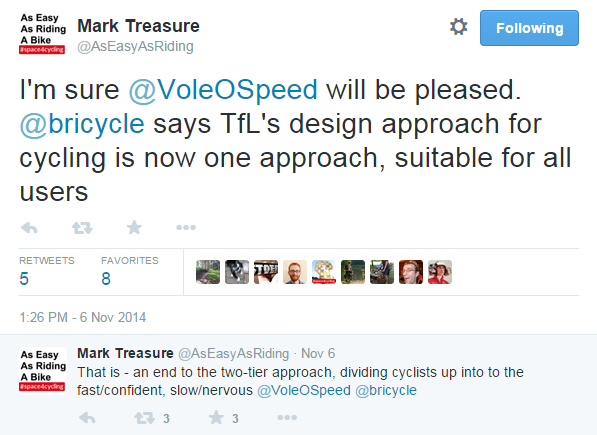 What chance will cycling have during future budget squeezes, without reliable core ring-fenced funding? 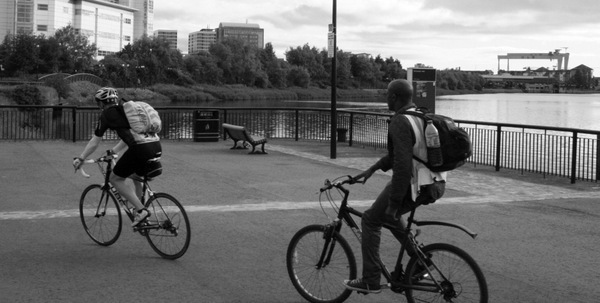 #JuneMonitoring Round: DRD's £1m capital infrastructure bid to kickstart the #CyclingRevolution rejected. So it begins. Which broadly speaking means DRD committed around 50p per head of Northern Ireland population each year for most of the lifetime of the 2000 strategy, compared to €24 in the Netherlands. And the headline result*? 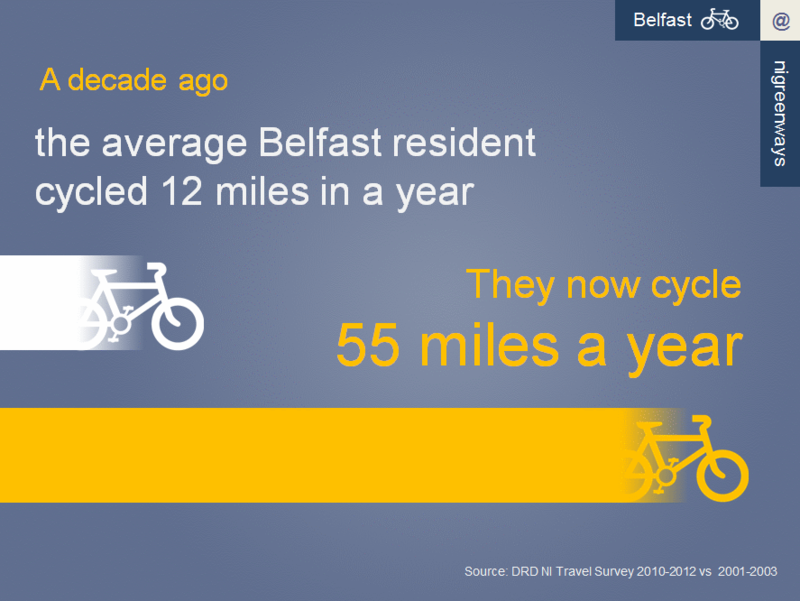 NI bicycle journey share in 2000? 1%. NI bicycle journey share in 2013? 1%. In hindsight it’s fortunate that the 2000 strategy tried to “encourage cyclists to wear helmets” because that’s 14 years of head-butting brick walls. However there are some encouraging recent signs of cycling growth in Belfast especially, and DRD’s future plan to raise annual per head spending to £4 may begin to make some impact. It’s important to set the new Bicycle Strategy for Northern Ireland in this context – it’s a positive high-level vision, but words don’t guarantee significant change, as the 2000 document shows. The devil will be in the detail of delivery plans, local masterplans, securing continuous funding and retaining political will. Hopefully this time round things are different, and I wish DRD well at the start of their new journey. In an NI cycling policy, all I really want is a consistent approach cycle lanes. Utterly baffling in Belfast at the moment. Northern Ireland’s much heralded Cycling Revolution™ is going to need some great promotion to become a reality. Step forward our Department of the Environment (DOE), where local road safety promotion sits in isolation from the road builders (and revolutionary vanguard) over at the Department for Regional Development (DRD). Recently DOE launched their first ever cycling safety video Respect everyone’s journey. It was a reasonable first effort, notwithstanding plenty of valid criticism. At least they wisely stayed away from the schlock-horror of their usual road safety adverts (see the international viral “hit” Shame on You). Comments on YouTube are (wisely) switched off, but the video has already attracted scorn and ridicule on social media. It’s difficult to see who the video is trying to patronise reach. But on closer inspection.. So it’s those death-wish cyclists with no regard for the rules of the road, who put themselves and others in danger, and generally don’t give a damn about respect – they’re the target audience. I reckon DOE’s instinct that a twee instructional video will make them think again is spot on. As with DOE’s previous video, I’m already struggling to see cycling as normal because of the awful music. Simple Minds behind the scenes – indeed. And Chris and Erin seem dressed and ready to appear in a James Bond opening title sequence rather than going for a cycle, because NO-ONE DRESSES FOR CYCLING LIKE THAT. EVER. Using the Stranmillis Embankment is an interesting choice. 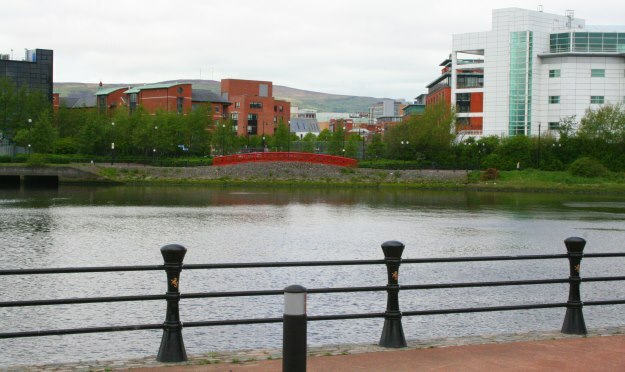 It’s by far and away the best on-road cycling space in Belfast, and was only just beaten into 2nd place by Derry’s Peace Bridge as NI’s best cycling infrastructure in the 2013 Fréd Awards. It’s also wholly unrepresentative of the typical cycling experience here. In fact, there are just 3 separate cycle tracks in Belfast, totally just 2.5km in length. Making a video to explain how to use a cycle track (and generally how to interact with other humans) is overkill. The Giro d’Italia passed along here in May 2014, but just weeks before the event, DRD’s Roads Service introduced another user to compete with cyclists – a variable message sign (and they got mildly arsey when people complained). Share the road indeed! According to DOE, cycling is not something you should be doing during rush hour; grow up and get a car for that, kids. It’s not like anyone would want to cycle to work, or to the shops in the morning, or hop on the bike for a 9am appointment etc. 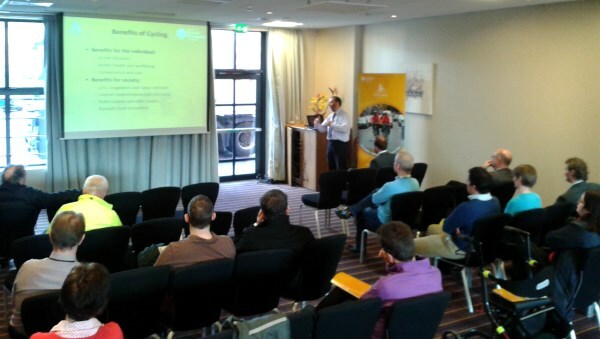 @beta_dad @nigreenways "A wee tip, try to avoid the busiest times." Oh right, so no cycling to and from work then? If you’re daft enough to try it, expect a slow, rough journey. Hmm. Now you mention it, that’s a scarily accurate representation of cycling in Belfast’s rush hour. Finally some feckin’ honesty and insight – chapeau! At 3.42 and 4.35 I became convinced that the video was a scalpel-sharp piece of satire – you got me DOE! It’s one thing that the Ormeau Road Bus Shelter and University contra-flow lane were voted in the top 5 worst pieces of infrastructure in the 2013 Fréd Awards (beaten only by a dinosaur tail – true story), but quite another for the government to then think it appropriate to use them in a cycling promotion video. Plonking a bus shelter in the middle of a shared use path is a nightmare for everyone using the space, more so for families with children or elderly people walking around the back. Don’t tell us how to navigate crap design, tell DRD how to redesign it! @nigreenways awful. 'watch out for Street furniture like bus stops' how about not having a cycle lane run directly into one. 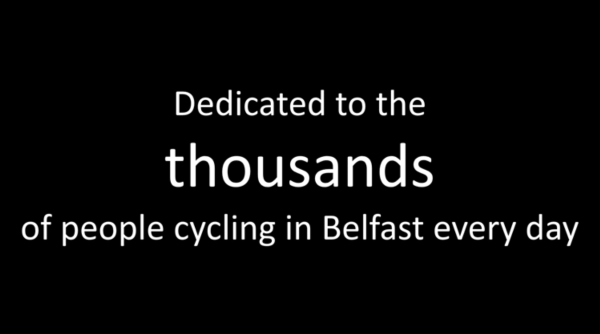 This is also NI’s first attempt on video to promote the contra-flow cycle lane concept, or at least DRD’s awfully executed attempt. If you need to use the phrases “But the danger is..” and “This is where you really need to be on high alert..” you’re admitting it’s dangerous crap, so just get rid of it! @nigreenways contra-flow one partic laughable-"watch out for car doors" How abt DON'T PAINT THEM IN THE DOOR ZONE!!!!! While being thoroughly patronised by this video, I knew I’d have to admit that DOE had all their facts sewn up, that their advice was legally watertight and all information presented would be factually correct. Every scene shows someone cycling in daylight hours, not between sunset and sunrise. So it’s safe to assume when Erin says ‘by law, you must have a red rear reflector and amber pedal reflectors” that means not just when the sun’s gone down, right? 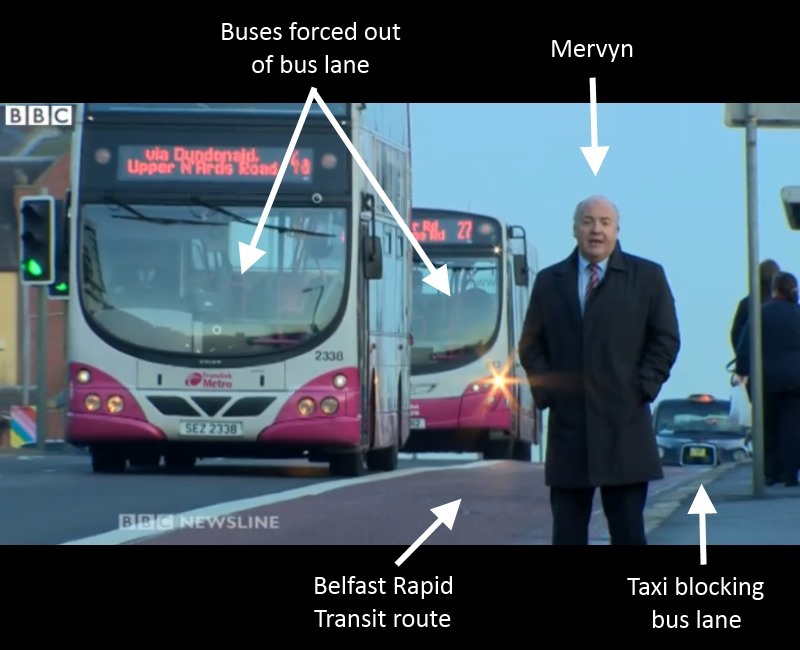 Damn right bus lanes are busy – by January 2015 DOE will create a single tier taxi system which will force the number of taxis in Belfast bus lanes up from 500 to around 4,000. Good idea to gloss over the destruction of cycling subjective safety at rush hour (hiya point #4). ..says Erin at 4.20. Meanwhile, back in the mists of time at 4.10, the girl in the video makes a ridiculous move without signalling her intent to the Renault Clio. All happy smiles and waves in the video; try that in the real world, and there’s more chance she’d end up in A+E. @nigreenways She sure takes a wild dive out in front of that car when "moving out at junction"
Can you say ‘Equality Impact Assessment’? Wheelchair users and those on mobility scooters might have a few things to say about your interpretation here, DOE. While riding on many footways is illegal (footway or footpath – check those legals again) and generally frowned upon (never mind slower, bumpier and probably more dangerous) it’s a symptom of poor infrastructure – people are scared away from traffic, and want to cycle in what seems like a safer place. Build better routes and more protected cycling space, then people will simply choose the better alternative. This is exactly the problem. The whole video is one long excuse for bad infrastructure, glossing over decades of under-investment in cycling. Countries with the highest cycling levels separate cycling as a transport mode distinct from motor vehicles and pedestrians, or unravels (high quality) cycling routes from the the busiest roads altogether. 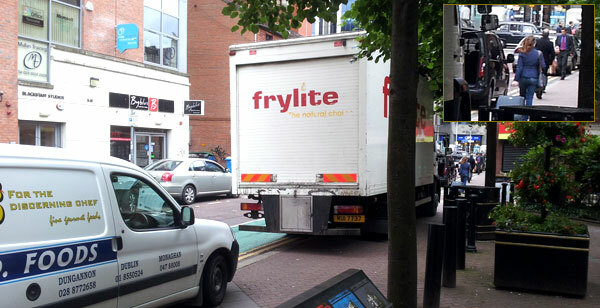 DOE admits (whether knowingly or not) that trying to ride a bike around Belfast is made difficult and dangerous because cycling is not properly catered for, because we have to compete with cars, lorries, buses, taxis – and then offers up some random methods for coping, to varying degrees of usefulness. cyclists have equal rights with dogs on shared paths – what progress..
@nigreenways my Highway Code must be fuzzy. I don’t recall the official hand signal for “thank someone who lets you out”. It’s a truly ill-advised piece of nonsense which does nothing to advance cycling promotion in Northern Ireland. Perhaps it’s time for DOE to fully hand over the reigns on this function to DRD’s Cycling Unit, who (from personal experience) actually know a thing or two about urban cycling. 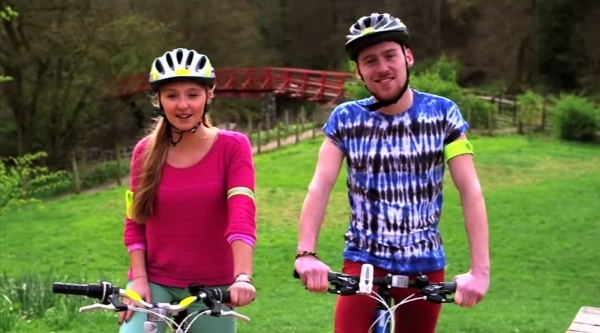 Is this the WORST cycling safety/promotion video in the world? @nigreenways awful video. You never see these for drivers. @nigreenways Did not know that. A bit like how NI is the only part of UK where jaywalking can be prosecuted. Our own peculiarities. @nigreenways bloody hell I managed 3mins of the patronising crap felt like I was being talked to like a kid. Since when was a bell a law?? @KenDeBiker @nigreenways Please tell me that's some kind of comedy skit…..